VietNamNet Bridge - The plan to make a switch from the popular RON A92 petrol to biofuel E5 by January 1, 2018 may fail as ethanol plants have become bogged down in difficulties. Deadlines for replacing A92 petrol with E5 biofuel have been set up, but all of them have been missed. Most recently, state management agencies decided that all filling stations in Hanoi, Hai Phong, Quang Nam, Quang Ngai, Da Nang, HCMC, Can Tho and Ba Ria-Vung Tau must begin selling E5 petrol on June 1, 2016. However, the plan has failed. In late 2016, another plan was set up under which E5 petrol would be replaced RON 92 by June 2017. However, in the latest move, the Ministry of Industry and Trade has proposed to delay the E5 use to January 1, 2018. The representative of a fuel distribution company in Hanoi said the sale of E5 has stopped because there were too few buyers and sales were only equal to 1/10 of the sales of RON 92. The plan to make a switch from the popular RON A92 petrol to biofuel E5 by January 1, 2018 may fail as ethanol plants have become bogged down in difficulties. Since there is just a small gap between RON 92 and E5 prices, consumers are still buying E5. Meanwhile, a source said the input materials to make E5 are seriously lacking. Tung Lam Co Ltd is now the only supplier of ethanol in the country. As the company is located in the south, it is time-consuming and costly to transport material. If all filling stations begin selling E5 right now, the supply will be short. Tung Lam can churn out 150,000 tons of ethanol a year, which is enough to make 3 million tons of E5 petrol. Vietnam needs 7.5 million tons of E5 a year. A part of Tung Lam’s ethanol is provided to the healthcare sector. To prepare for biofuel use throughout the country, the state has built ethanol plants to satisfy domestic demand. 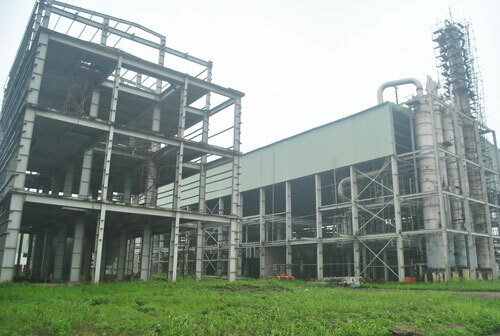 However, three ethanol plants in Binh Phuoc, Quang Ngai and Phu Tho with total capacity of 300 million liters per annum all have been unprofitable and either have been left idle or running at moderate level. No solution to revive the plants has been found. Dang Dinh Dao, former head of the Hanoi Economics University’s Institute for Economic Research and Development, commented that in a market economy, the sales of food depend on quality and price. The E5 price is not attractive enough to encourage people to use the biofuel. A representative of a filling station admitted he has not had the necessary equipment to organize the sale of E5 because the biofuel plan has been delayed many times.